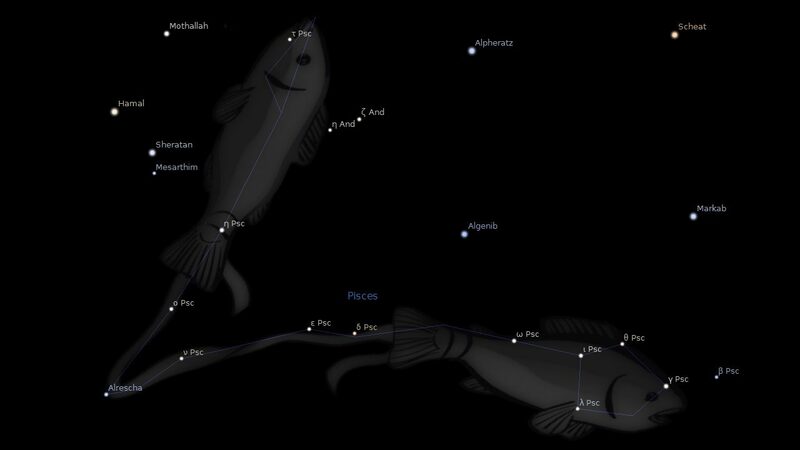 Fixed star Alrisha, Alpha Piscium, is a 3.8 magnitude double star, pale green and blue, marking the knot in the cord that binds the Fishes, Pisces Constellation. The name Alrisha comes from Alrescha, the Arabic الرشآء al-rišā , meaning the well rope. Another old name for this star is Okda, from the Arabic عقدة uqdah, which means knot. The prime star of the Constellation, α Piscium, is Alrisha, The Cord (or String). This apparent double star at the point where the two arms of the figure meet. In some portrayals, the fishes themselves are at the far ends of the arms, so that the long string is folded at the star α as though being held at that point. In some Latin works this star is called The Node of the Fishes, or of the Two Strings, Nodus Piscium or Nodus Duorum Filorum, which describes the position precisely but has not remained in general usage. It is here mentioned only for the record, as also the Arabic rendering of the same title, Al Ukd Al Haitain, or Ukda, or Kaitain, with variations on those spellings. In general, the better name to use and remember what we started with, Alrisha, though it is worth warning the reader that this name has also been used in the past for the star β Andromedae, better known as Mirach. However, Alrisha, is practically conjunct with the Great Galaxy in Andromeda; and this latter, a glorious family of billions of stars, must surely take precedence over the barely visible α star in Pisces. 1. Fixed Stars and Judicial Astrology, George Noonan, 1990, p.55. 2. The Living Stars, Dr. Eric Morse, 1988, p.118. I have this exact my moon. MyUrduHoroscope.com is best website for reading about horoscope. All zodiac signs Personality profiles are available here. Visit the website to read your today horoscope. Hi Jamie, Does Alrisha have any affect on the Mid-Heaven?